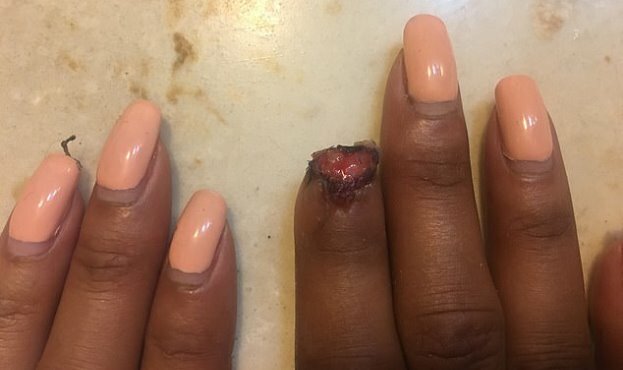 A woman has regrown her fingertip after it was bitten off by a puma while she was vacationing in Honduras. Ja'Niya Walker, from Los Angeles, California, took a trip with her friend to Roatán in July 2017, where they visited an animal sanctuary. She had her hand resting on the cage of a puma when the animal reached over and bit her right index fingertip off. 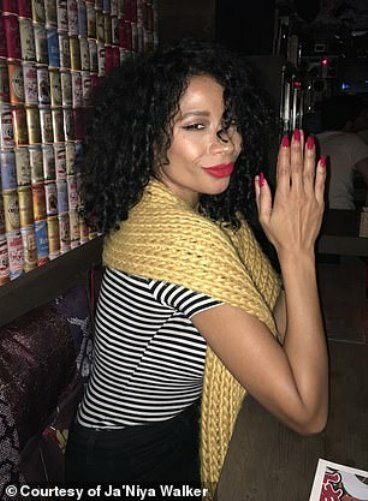 Doctors told the 40-year-old fashion designer that there was nothing they could do and that she would have to accept that she would have an amputated finger for the rest of her life. That is until she met a doctor who offered her an usual alternative: using platelets from her own blood which have stem-cell like properties called growth factors, and by injecting them into her finger, they could stimulate the growth of her fingertip. In an exclusive interview with Daily Mail Online, Walker discusses how she saw results in as little as two days and that she knew she had her life back when she was finally able to glue an acrylic nail on. Walker said that it was on the second day of her trip, while visiting the Little French Key Island, when the incident occurred. She and her friend had been enjoying the beach, swimming and drinking, when around 5pm they decided to visit the animal sanctuary. 'The monkeys were almost asking us to come and feed them and give them water,' Walker told Daily Mail Online. Walker said the wildcats were coming up to the cages and nuzzling the visitors. The animal had grabbed hold of Walker's right index finger. When she pulled back instinctively, her fingertip 'came right off'. She can't remember how bad it was bleeding but she remembers grabbing the towel that was around her neck and wrapping it around her finger. She could see the tip still hanging on the cage. 'I could see my fingertip on the cage, almost looking at me, and I was yelling at my friend: "Take my fingertip! Please! Maybe they can sew it back on!"' Walker said. Her friend flagged down a passerby, who took them on a jet ski to the main island. Walker remembers furiously puffing on a cigarette to calm her nerves as said passer-by got a car to take her to the hospital. She estimates was at a hospital within 20 minutes. Walker still had three more days on the island so she swam with her hand in the air and visited a hand surgeon every afternoon to get properly cleaned. When she returned home, she had to visit doctors to take care of her wound. 'No doctor I saw - and I saw four doctors - offered support or advice. They just said you can collect disability for the rest of your life,' Walker said. Through research, she found Dr Akash Bajaj, an orthopedist and pain management specialist based in Marina Del Rey. 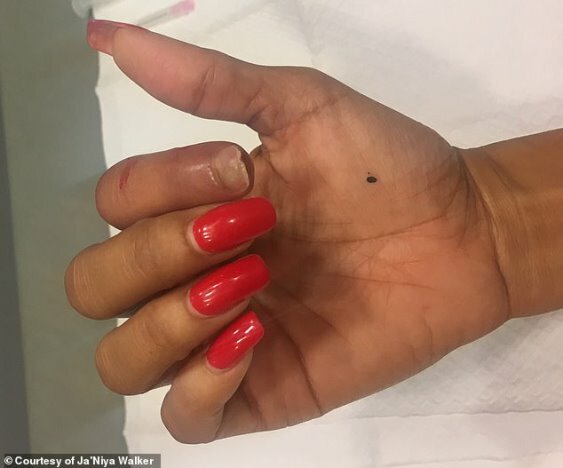 He told her that with the help of something called platelet-rich plasma (PRP) technology, he could stimulate the growth of her missing fingertip. Walker was lucky her fingers amputated below her nail because PRP technology cannot regrow an entire finger. Blood is mainly made up of liquid, or plasma, but it also contains red blood cells, white blood cells, and platelets. Platelets are responsible for clotting blood and contain proteins known as growth factors, which are similar to stem cells and help injuries heal. Blood is drawn from the patient and spun in a centrifuge - a machine with a rapidly rotating container - to separate the platelets from red and white blood cells. This increased concentration is then injected into the affected area. 'The way that I explain it is that the body is using its own repair therapy to heal itself without steroids or other medication,' Dr Bajaj told Daily Mail Online. Walker went in for her first appointment in late August 2017 after her stitches were removed. She said within the first two days she noticed results. 'It was instantaneous,' she said. 'For a while I had to lift up my finger when I was doing dishes and shower with a paper bag over my finger. Dr Bajaj admitted that he was even surprised by her results. Walker said the true test of her progress was when she attended LA Fashion Week last October, just two-and-a-half months after her accident. 'I was able to put an acrylic nail on over my old nail and no one was able to tell what had happened to my finger. I felt like I had my life back,' she said. Walker went it for her last appointment a few weeks ago and said she finally has gotten back into jewelry making and cooking again. She says she hopes her story inspires others to try alternatives if they're not satisfied with what they're being told.